We work hard to ensure that the books come out without any errors, but some always sneak in. 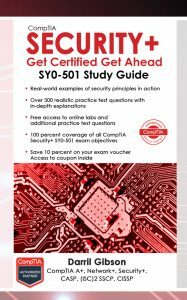 This page is dedicated to sharing errors identified in the CompTIA Security+: Get Certified Get Ahead: SY0-401 Study Guide . If you know of any errors in the book, please let me know. Note: If you’re having trouble accessing the labs at the primary location, you can use the alternate location here. Update to Kindle has been submitted. Internet Protocol security (IPsec) uses protocol ID 50. UDP port 1721 is not relevant for the Security+ exam. You calculate the ALE as SLE x ARO. Advanced Encryption Standard (AES), Data Encryption Standard (DES), and Message Digest 5 (MD5) are all block ciphers. Advanced Encryption Standard (AES) and Data Encryption Standard (DES) are block ciphers. Message Digest 5 (MD5) is a hashing algorithm. Correct answer is A (CRL), not C (OCSP). The explanation is accurate. Correct answer is A (bollards), not B (guards). The explanation is accurate. Some systems consider an alarm and an alert as the same thing. Other systems use an alarm for a potentially serious issue, and an alert as a relatively minor issue. It’s important to set the IDS threshold high enough to reduce the number of false positives but low enough to alert on any actual attacks.. Administrators often set the IDS threshold high enough that it minimizes false positives but low enough that it does not allow false negatives. These methods don’t block or weaken authentication. Additionally, they don’t prevent single sign-on methods using transitive trusts. 1. Your organization wants to improve the security posture of internal database servers and protect against zero-day vulnerabilities. Of the following choices, what provides the BEST solution? Question 17. Which of the following is an attack against servers hosting a directory service? The second sentence in the last paragraph on this page has a phrase (“as a management control”) that should be deleted. Security administrators use vulnerability scanners to identify which systems are susceptible to attacks. Note: A vulnerability scanner is a technical control. A vulnerability assessment is a management control. For example, if a question asks what you would use to hash and it lists encryption algorithms, you can quickly eliminate them because they don’t hash data. Although the processing power of computers has advanced since 2010, so has the number of bits in keys used by RSA. Advanced Encryption Standard (AES) and Twofish encrypt data in 128-bit blocks. Correct answer is C (RADIUS), not B (SAML). The explanation is accurate. Learn mode – randomized. View each of the questions in random order. Learn mode allows you to keep selecting answers until you select the correct answer. Once you select the correct answer, you’ll see the explanation. Click here to see how learn mode works. Learn mode – not randomized. View each of the questions in the same order. Use this if you want to make sure that you see all of the questions. Learn mode allows you to keep selecting answers until you select the correct answer. Once you select the correct answer, you’ll see the explanation. Click here to see how learn mode works. Test mode – randomized. View each of the questions in random order. In test mode, you can only see the correct answers and explanations after you complete the test. Click here to see how test mode works. Test mode – not randomized. View each of the questions in the same order. In test mode, you can only see the correct answers and explanations after you complete the test. Click here to see how test mode works. Test mode – 100 random questions. View 100 random questions from the full test bank similar to how the Security+ exam has a potential maximum of 100 multiple choice questions. In test mode, you can only see the correct answers and explanations after you complete the test. Click here to see how test mode works. Online practice test questions are just a few clicks away. You’ll receive an email granting you access shortly after you make your payment. Click here to get your coupon code for a 10% discount on your CompTIA voucher. No risk. You use this code at the CompTIA Marketplace. Click here to check out this page for a full listing of mobile device apps available from Darril's partner LearnZapp.